The Levant is an old term referring to countries of the eastern Mediterranean. 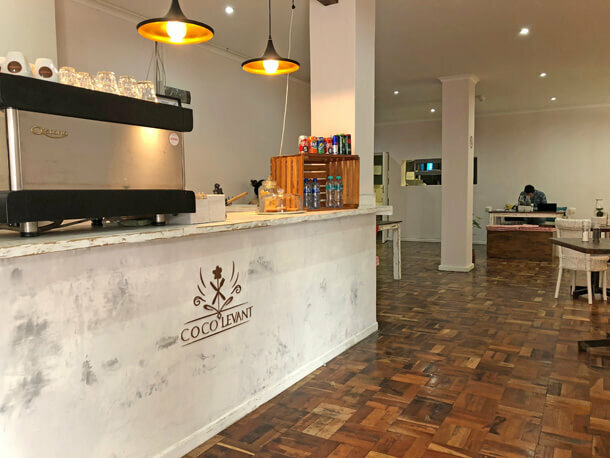 So the use of the term in the name of this new eatery situated in Parow in the northern suburbs, Coco Levant, conjurs visions of a traditional middle eastern setup with rich warm colours and and the expectation of a menu filled with unusual dishes inspired by the cuisine from this area. We visited on a Saturday morning during September and were met with a somewhat different looking space. They have borrowed from a more greek influence and the feel of the restaurant was more spare with cleaner lines. 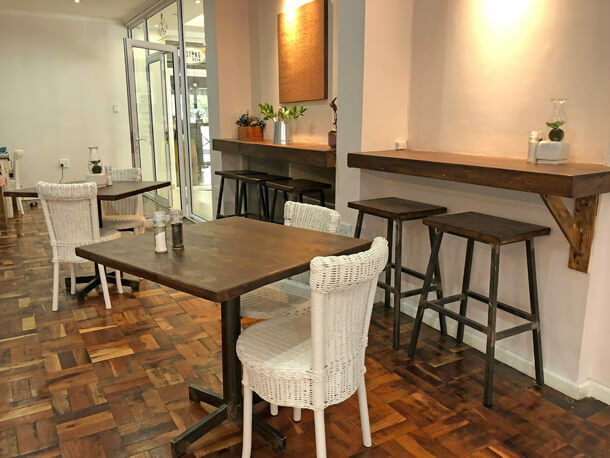 White walls and wooden parquet flooring juxtaposed with dark topped tables and an eclectic mix of rustic white wicker and more modern designer chairs. 2 larger tables, suitable for groups had bright pillows against the wall which lent some of that middle eastern flavour. One of the tables was occupied by a group of ladies having breakfast and the other by a man busy on his laptop. He seemed to be a guest of the hotel in which this restaurant is located. The New National hotel is a small recently revamped hotel situated on Voortekker Road, just about 2 blocks over from Parow Centre. It’s an unexpected place to find a hotel but there seem to be some recent refurbishments happening on the Voortrekker Road corridor and this may well be a part of it. Much like the upliftment of the Woodstock area around the CBD has improved the area one hopes the same will happen here. 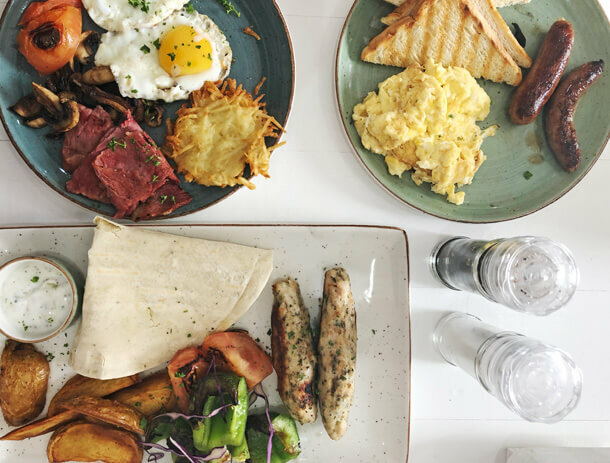 We decided to take a seat in the far corner of the restaurant near a glass door where there was more light so I could take some decent photographs of our food, I know, job hazard… Our waiter took our order for cappucinos while we mulled over the menu and decided on what to order. He was friendly enough but seemed a bit inexperienced and tentative and wasn’t able to make recomendations. The cappucinos were strong but really good and we enjoyed them while waiting for our meals to arrive. They had just opened in June so were running some opening specials. 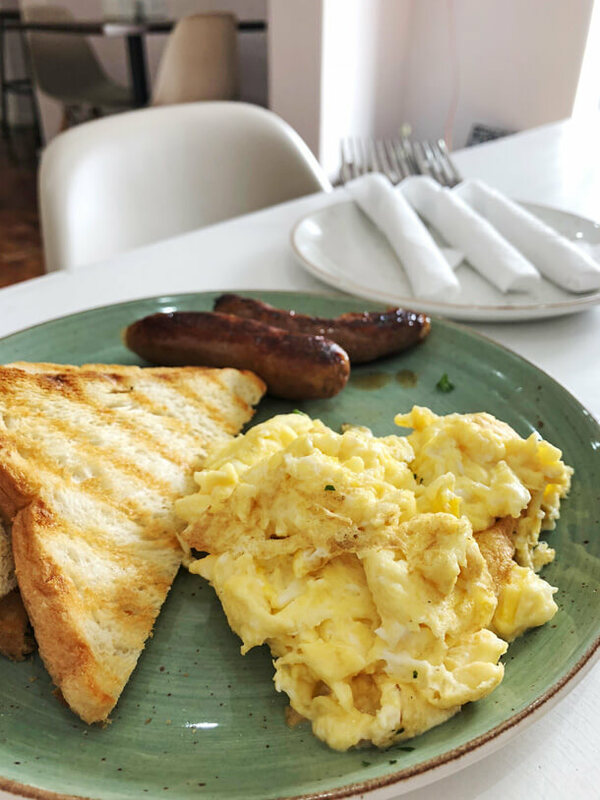 We opted for a scrambled eggs and sausage breakfast special at R25 for Taufeeq, the Signature breakfast at R70 and Chicken Kebab at R60 for us. I had wanted the Mediterranean breakfast which included falafel with an assortment of dips and veg sides but they were completely out of falafel. Disappointing for a mediterranean restaurant to run out of a staple like that. There was burgers, pasta and even curry on the menu which the waiter said was popular. And for an old school touch, I spotted jaffles as an alternative to a toasted sandwich. 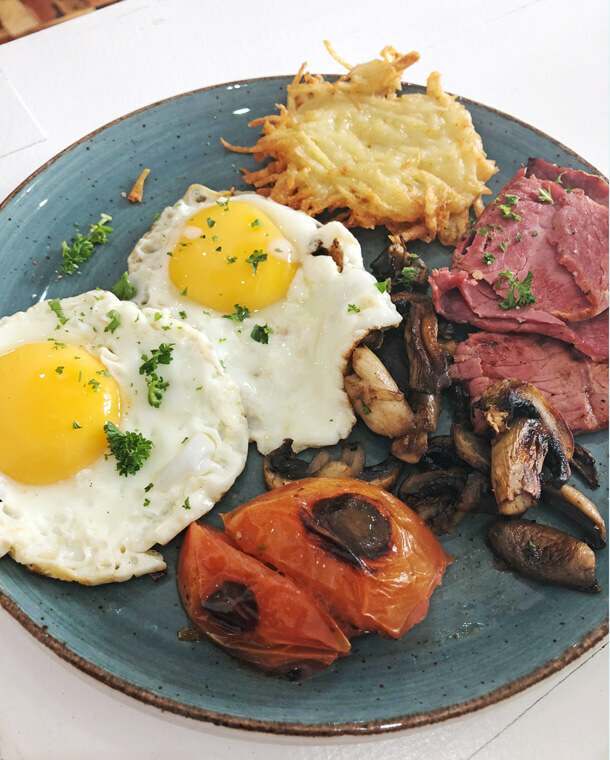 Zulfi’s breakfast was generous with 2 fried eggs, mushrooms, fried tomato, macon and a potato rosti. But his eggs were undercooked and his 2 slices of toast came with margarine instead of butter. While I realise butter has become really expensive, this is a not a compromise I feel any restaurant should make. 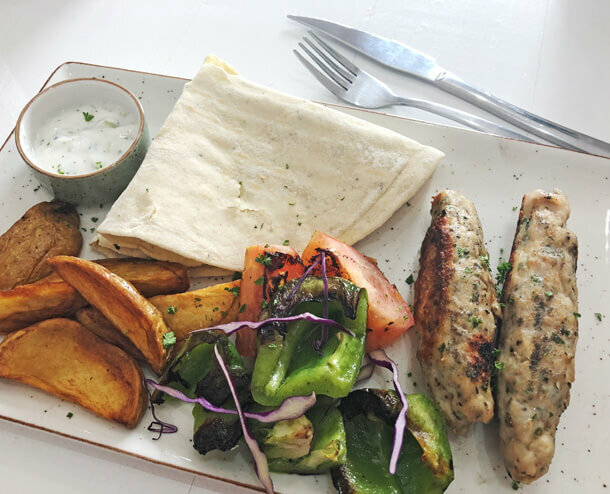 My chicken kebab came with 2 well sized minced chicken kebabs, grilled chunks of green peppers and tomato, some potato wedges and a small bowl of tzatziki. This was served with a traditional unleavened Saj bread. The kebabs were tasty, not spicy but well flavoured with herbs. I found this dish dry though. Upon mentioning this to the chef, he offered hummus and garlic mayo which did make a difference. The breakfast special which Taufeeq had was good value for money and the sausages, which I am fussy about was spicy and tasty. I did manage to swipe a piece while he wasn’t looking. I also liked that that their takeaway packaging was eco friendly. We ordered a mutton gatsby and it was thee best mutton gatsby ever. Everytime we go there we receive great service and great food. Keep it up guys.